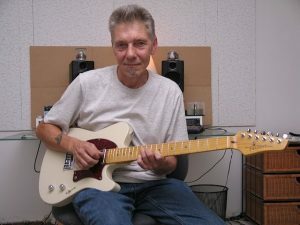 Howard “Buzz” Feiten (born November 4, 1948) is an American singer-songwriter, guitarist, session musician, and luthier. He is best known as a lead and rhythm guitarist and for having patented a tuning system for guitars and similar instruments. Feiten also manufactures and markets solid-body electric guitars. Feiten grew up in Huntington Station and Centerport, New York, where he was known by schoolmates and friends as ‘Buzzy’. Son of a musical mother, Pauline (a classical pianist), and an airline pilot, Howard Sr., Feiten received training in classical music as a child. Feiten’s older sister Paula was a flautist, and became a top fashion-world ‘cover girl’ model in the mid-1960s. A younger brother, Jon, was also involved in music and the arts. In youth, he studied several musical instruments, finally settling on the French Horn. As a teenager, he played in all-county (Suffolk) and all-state (New York) youth orchestras on the instrument. Feiten first played Carnegie Hall in 1966, on French Horn, in a select All-American orchestra, American Youth Performs. He would later return with other major acts, such as Rickie Lee Jones. In 1966, he auditioned at the Juilliard School on the French Horn but was not admitted. Feiten was credited on the French Horn on one of the Paul Butterfield Blues Band’s 1960s albums. His debut in commercial pop / rock music was with a high school band called The Reasons Why (other players were Steve Beckmeier (rhythm guitar), Al Stegmeyer (drums), Danny ‘Fingers’ Horton (lead guitar), and Daniel Kretzer (keyboards)). The Reasons Why were locally successful on Long Island, and two of their songs, “Tell Her One More Time” and “Same Old Worries” were mentioned in a Billboard ‘new singles’ article in the summer of 1966. Still known as ‘Buzzy’, he backed up Jimi Hendrix and B. B. King on electric bass in late 1968 or early 1969, while a student at NYC’s Mannes College of Music. These experiences helped qualify Feiten, now increasingly seen as a ‘wunderkind’, to audition for and join the Paul Butterfield Blues Band, filling the post of the recently departed Elvin Bishop, who had gone solo. Feiten recorded on the group’s fifth album, Keep on Moving. With Butterfield, Feiten toured internationally and played such gigs as the Atlantic City Pop Festival and the Woodstock Festival. His playing can be found on some of the Woodstock recordings, including the second ‘official’ video compilation. As he matured into the adult music scene, his nickname became modified to ‘Buzz’.